Jadavpur University has been making international headlines for the last four months. The campus has become synonymous with a historic students movement directed against growing gender violence, intensified sexual inequality and brutal authoritarianism of the university authorities and the state government. These tendencies have been on the rise in West Bengal since 2011. The safety of women and girls in public spaces has been trampled upon by anti-social forces associated with the ruling party. From Kamduni to Madhyamgram, from rural colleges to urban university campuses, girl students are facing grotesque sexual violence. In this climate of emboldened misogyny, our university campus witnessed an ugly incident on the evening of 28 August 2014. A second-year student complained of being molested by male students resident within the campus. We approached Prof. Abhijit Chakraborty, Vice Chancellor for justice. His voice reflected the general tone of the TMC administration ruling this state. He wanted to suppress the complaint and refused to discuss this issue, one of urgent concern, with the students and the victim’s family. After 100 hours of sit-in protest by students, there was no response from either the VC or the university’s Executive Council, the highest decision-making body. As the then General Secretary of Arts Faculty Students Union, I had to resign from the Internal Complaints Cell (ICC). I was the sole student representative there. The other members of ICC had been selected by the VC (rather than being elected through a democratic process). These were ‘loyal’ faculty members bent on helping the university authorities to suppress the voice of the complainant. As the non-violent protest against the VC’s indifference and attempted suppression of the complaint gained ground, the authorities handed over the campus to the custody of the local constabulary. Police pickets began in the campus despite widespread objection by faculty and students. On the night of 17 September at 2 AM, the VC unleashed the combined might of the local police and thugs on student protesters. Brutal treatment and molestation accompanied arrests made by the police. After this incident, we, as students of Jadavpur University, came under the banner of a united student movement. Our movement began with the aim of achieving five demands: 1. Removal of Prof. Abhijit Chakraborty as Vice Chancellor 2. Independent judicial enquiry into the molestation incident of 28 August 3. Independent judicial enquiry into brutal police action against peaceful student protesters during the early hours of 17 September 4. Immediate reconstitution of ICC so that it functions in a democratic and transparent manner 5. End of campus surveillance by the police. On 20 September, a huge demonstration made its way through the streets of the city. We received support from the wider society. Large segments of common people and students from other institutions joined us; they have been feeling outraged by official indifference/incitement to sexual violence and rising police brutality which have now become routine in West Bengal. Our procession led us to the Governor of West Bengal who also happens to be the Chancellor of our University. We described our ordeal in detail and requested him to help us achieve our demands. Continued indifference of the authorities and the contempt of the state government towards our movement were expressed through counter-demonstrations organized by the TMC outside our university. The government even went so far as to reward Prof. Abhijit Chakraborty with the position of permanent Vice Chancellorship for the next four years. The order, announced in October, was signed by the Chancellor even though we had urged him to remove Professor Abhijit Chakraborty from his position as the interim-VC. On 17 October, a symbolic fast was held by a large mass of students. Our next step was to hold a students’ referendum on our 5-point charter during 30-31 October in the Arts Faculty followed by similar referendums in the Engineering and Science Faculties. There was an overwhelming show of support for the removal of the VC (97%) and other demands. In this context, I should point out that we had been boycotting classes since the police action on 17 September night. After a break, we decided to return to class. We did not wish to disrupt our studies and simultaneously continued with the movement. We were not responding to roll-calls since we were not willing to allow the university authorities to claim that ‘normalcy’ had returned to the campus. As long as the VC remained in situ, how could we forget his gross, draconian actions against the student community? We took the end-semester examinations. Even when writing the answer-scripts, we remembered to protest in a novel way. We signed a separate sheet during examination dates; this was a rallying call demanding the VC’s resignation. Meanwhile, the university’s annual Convocation Day was approaching. On the eve of the Convocation, a General Body meeting was held by the students and we decided to boycott the event. On the night of 23 December, I learnt that I was to be awarded the Best Graduate Medal next morning at the Convocation. I decided to decline the medal as a participant of the united student’s movement. 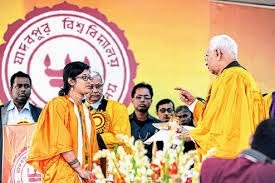 Next day, I went to the Convocation, got on the stage when my name was called and politely told the Chancellor I could not accept the award in the presence of the VC who had refused to listen to a student who had been molested and summoned the police to beat, molest and arrest peaceful student protestors. The Chancellor asked me to leave the venue. My sole intention was to publicly reiterate before the higher authorities of the university that we were firmly committed to achieving our demands. Sadly, my public gesture was misinterpreted by some and I faced unpleasant criticism. My political conviction and that of my comrades was also vilified since we are clearly on the left. Having said this, the action on my part was followed by similar actions by my fellow students who refused to accept medals, degrees and certificates at the Convocation. Our peaceful boycott was successful despite the stray abuse faced by some of us for taking this step-an act of conviction in our movement born in desperate times. We were able to convey to the general public that we could not accept awards in the presence of a VC who was destroying our university. In a sense, our movement was entering a critical stage. For the past three months, we had held varied forms of protest yet remained peaceful. The VC had criminalized us, called us names, called in the police and accused us of carrying sharp weapons. We were unarmed. Our only weapon was the united movement composed of ourselves. On 5 January 2015, a General Body meeting of JU students was held. A solemn decision was reached. Twelve friends began a fast-unto-death. After five days had passed, the Education Minister offered to meet them at his office in Bikash Bhavan. Our friends were carried there in an ambulance as some of them were already showing signs of physical deterioration. The Minister did not make any firm commitment. Over the weekend, two friends were hospitalised and others fell sick. Under these circumstances, on 12 January, the Education Minister came to JU to meet us. Within half-an-hour of his arrival, Mamata Banerjee, Chief Minister, West Bengal also arrived. After meeting the students, she suddenly made a dramatic announcement: the VC had agreed to resign. We were overjoyed. This had been our principal demand. The determination to remove him had started our movement. We saw the CM’s announcement as a gesture of retreat. It was an open declaration of defeat: the government has been forced by the united resistance of students to capitulate to our first demand. At the same time, the CM’s propensity for drama was a sober reminder that the Chancellor is the only authority-figure empowered to formally remove the VC by law. This prompted certain questions: How can the CM interfere so blatantly in the functioning of a supposedly autonomous institution? Did her gimmick not give away the fact that Prof. Abhijit Chakraborty had been installed over us by her government? Have they not taken him back because we refused to accept him? How long can we put up with the brutal and anti-democratic interference in the running of schools, colleges and universities by the TMC hooligan-driven autocratic state government? How can we accept the new draconian law controlling higher education in West Bengal which has effectively done away with the internal democratic structure of institutions, including democratic representation of students in highest decision-making bodies? Today, the Executive Council of Jadavpur University is bereft of even elected faculty members. Selection, rather than election, is the motto. Students and non-teaching staff have no representation, democratic or otherwise. This is completely unacceptable to us. We must fight the legal structure that binds us to authoritarianism in every campus. We must prevent our own campus from being turned into a prison camp, a detention centre of the Guantanamo Bay variety. The other main demands are still to be met. We must fight for them and win against the combined forces of patriarchy, autocracy and rightwing violence. Only future unity of the student movement can help us to achieve these aims. We are fighting to save our university, an open space that had made us happy in the past. It is not owned by the state government, the TMC or the police. The wider dimensions of our struggle, however, are not just confined to restoring democracy within our university. We want campus democracy in every educational institution alongside freedoms of ordinary people which are worth fighting for everywhere.